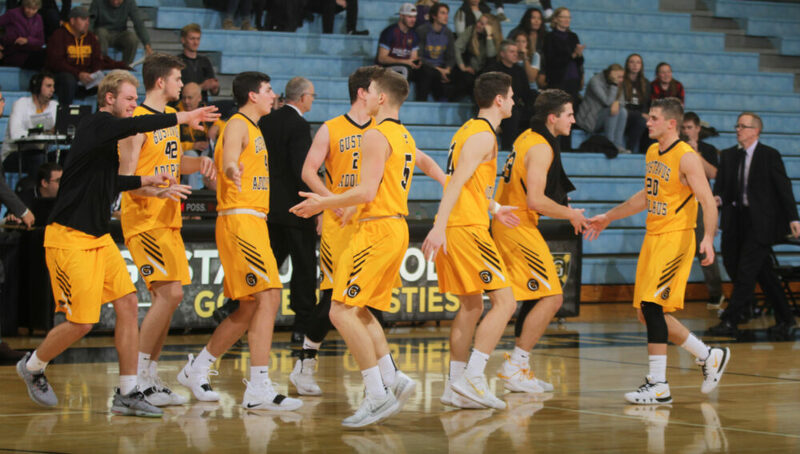 MOORHEAD, Minn. – The Gustavus men’s basketball team did its part by defeated Concordia 81-68 on Saturday afternoon and got some help from Bethel to secure the sixth and final spot in the MIAC playoffs. With the win the Gusties improve to 11-14 overall and 8-12 in the MIAC. After the Gusties got out quick to a 5-0 lead, the teams went back and forth for the majority of the first half. The first 20 minutes saw 12 lead changes with neither team going ahead by more than a possession after the first two minutes and the Cobbers holding a 32-30 lead going into the break. In the first half of play, the Gusties got seven points out of Riley Sharbono (Sr., Marshall, Minn.) and six out of Isaac Douglas (So., Montevideo, Minn.) to lead the offense. Gustavus shot just 13-of-32 (40.6 percent) from the field and 2-for-7 (28.6 percent) from beyond the arc in half number one. The 32-30 lead was the last lead Concordia would see in the contest as the Gusties opened half number two with baskets from Sharbono and CJ Woda (So., Maple Grove, Minn.) to take a two-point lead. The game would then be tied on the next two possessions at 34 and 36 by the Cobbers until Sharbono buried two straight shots to put the Gusties up 40-36. Although Gustavus started the second half on a hectic pace, scoring 20 points in the first seven minutes, the Cobbers were able to keep pace and trailed the Gusties 52-48 with 12:21 to play. Over the next four minutes the Black and Gold were able to start putting the game away, going on a 13-2 run, capped off by a Marten Morem (Fy., Caledonia, Minn.) three-pointer with 8:40 to play to take a 65-50 advantage. The Cobbers were able to pull the game back within single digits a few times late, but the Gusties knocked down free throws and got a few key offensive rebounds to help seal the deal and earn the Black and Gold a trip to the MIAC playoffs. Sharbono, the senior captain, played a huge role in the contest putting together a game-high 20 points on 9-14 shooting. Logan Rezac (So., Andover, Minn.) was right behind him with 16 points off the bench, while Woda and Vannis Smith (Jr., Crystal Lake, Ill.) each notched 10 points. The Gusties will be the six seed in the playoffs and will travel to Bethel on Tuesday night for a 7 p.m. contest with the Royals.